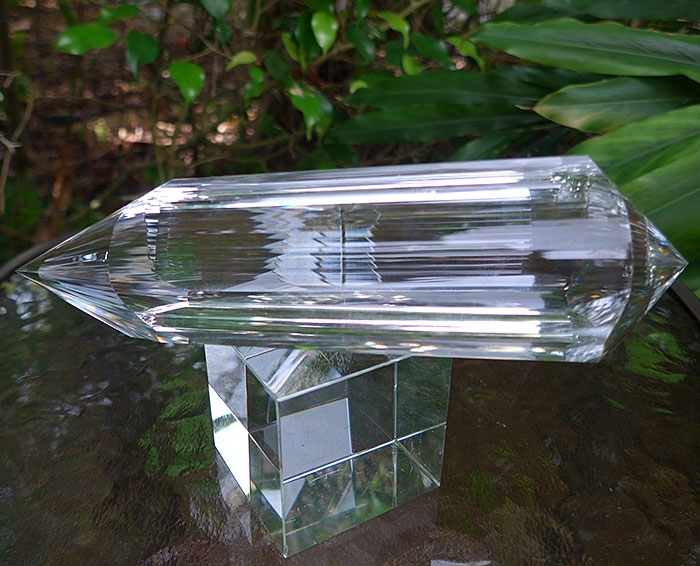 Dimensions (HxWxD): 7.875" x 2.28" x 1.875"
This 7.9 inch long Huge Water Clear Triangular 3 Convex Channel 6 Gate Master Cut 72 Facet Golden Dolphin Vogel Wand, weighing 1.67 pounds, 756 grams, or 26.65 oz. 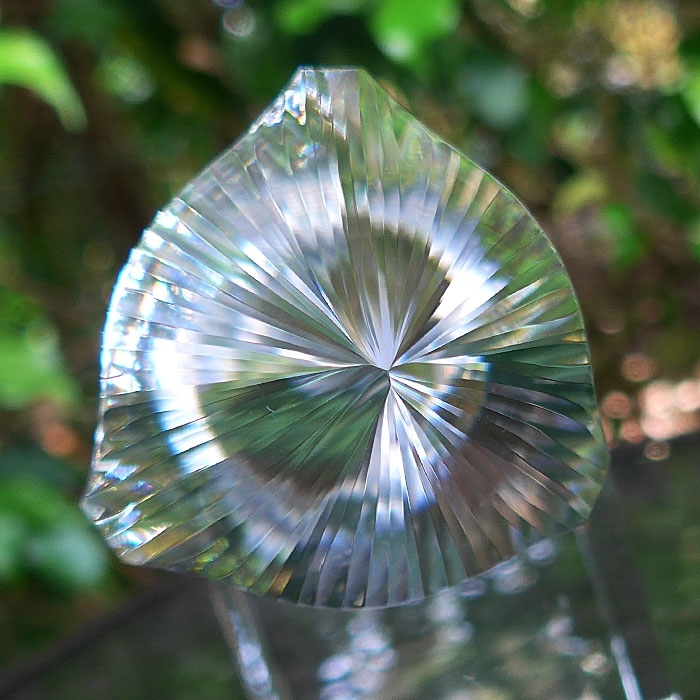 was cut by Brazilian Crystal Cutter Ray Pinto from natural Brazilian quartz sourced from Ray's family's mine. The 3 Convex Channel 6 Gate 72 Facet Triangular Golden Dolphin Vogel Wand has three convex faceted ridges, or "channels", on the shaft, and six concave "gates" or zones, on either side of the faceted ridges. The male and female termination tips each have 72 flat facets. 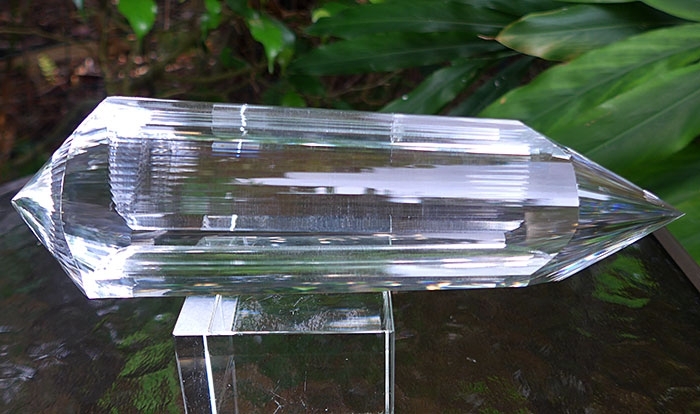 The intricacy of this design is a testament to the astounding mastery of Ray Pinto, the Brazilian master cutter and energy healer who created this one-of-a-kind crystal wand. This wand can be used for healing at the cellular level. This Golden Dolphin Vogel wand is specifically designed to promote healing at the cellular level, even at the genetic level, by directing a flow of Universal Life Force energy to the deepest levels of the cells making up our bodies. 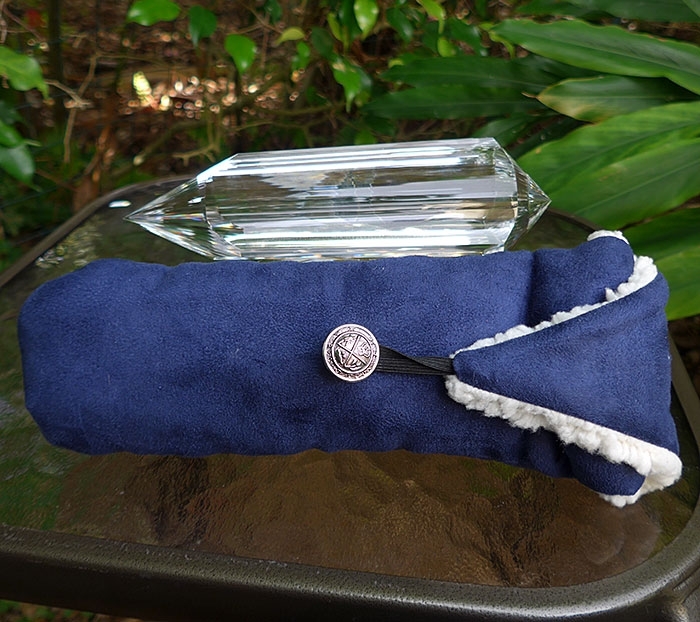 This wand has a very comfortable fit in the hand for a lightworker or meditator. It has beautiful proportions, and all hand movements I experienced when using this wand in meditation and for Reiki healing were smooth and easy. This beauty is water clear throughout. 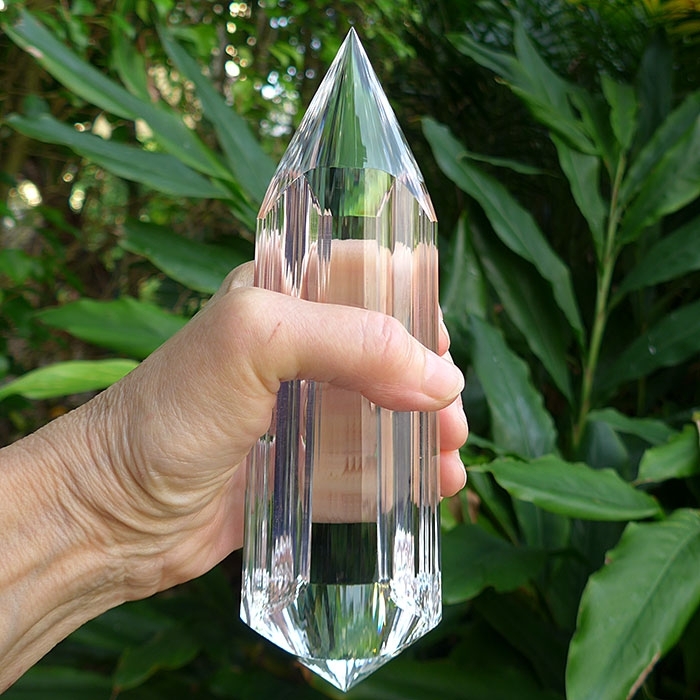 For healers working in the shamanic healing tradition of Alberto Villoldo, water clear Vogel wands are considered a requirement for extraction work, which removes negative energies and entities from individuals' auras and bodies. This 3 Convex Channel 72 Facet Triangular Golden Dolphin Vogel Wand would be the ultimate shamanic tool for practitioners from such a school. 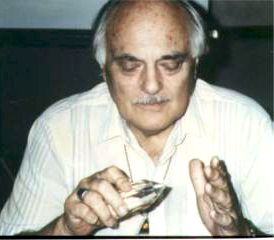 From his experimental work with crystals, Vogel learned that by pointing a crystal at another person, the crystal would amplify the person’s thoughts and emotions. This often also led to putting the individual into an altered state of consciousness. The next step was for Vogel to utilize the quartz crystals for therapeutic purposes. Then Vogel began having his own healing crystals cut according to exacting specifications to enhance the flow of energy through the crystals. The triangle is the symbol of the Three Worlds, the Causal, the Astral and the Physical, and of the three primary attributes of all human beings: body, mind and will. The upward pointing triangle is a traditional symbol for fire, for Universal Life Force Energy. The circle is the symbol of Unity. Thus this 3 Convex Channel 6 Gate 72 Facet Golden Dolphin Vogel Wand has been fashioned to ground the energy of the One Source for purposes of healing and meditation. This is truly the work of a master craftsman, whose intent is informed with a most modern understanding of the ancient wisdom incorporated in forms of nature as manifested in the art and science of sacred geometry. Ray Pinto, the creator of this remarkable design, tells us that the convex ridges on this Golden Dolphin wand resonate with the y chromosomes found in the nucleus of human cells. The concave zones resonate with the x chromosomes in the nucleus of human cells. Chromosomes are found in the nucleus of human cells, and contain the genes that help to regulate the growth and structure of our bodies. Ray designed the Golden Dolphin Vogel wands to promote healthy formation of new cells, tissues and organs, and to help free the body of free radicals and mitigate the deterioration of form and function that beset our cells, chromosomes and genetic material as part of the aging process. In addition to the radical new design of the convex ridges on this wand, Ray incorporated six widely popular concave "gates" into the design, enabling the user to direct both a strong highly concentrated stream of energy from the tip of the wand and also a wide beam of energy at the same time. The wands with these unique "gates" are known as Dream Vogel Wands. In 1997 Vogel appeared to Ray Pinto, who is the Brazilian cutter of these unique healing wands, in a dream. In the dream, Vogel showed Pinto the design for a unique healing wand with four concave faces nestled among the traditional flat facets, and containing the traditional 24 flat facets on male and female ends. It took Ray nearly two years to refine the equipment he uses to cut the stones so that he could produce these exceptional precision healing tools. 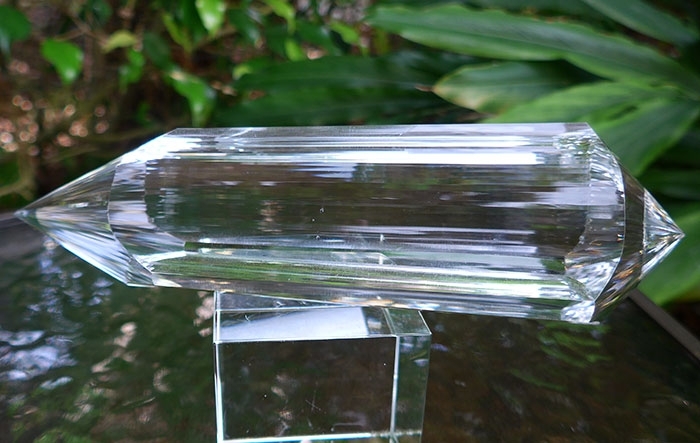 This design became famous among crystal healers as the Dream Vogel Wand. Recently, Pinto received information about this new Triangular 3 Convex Channel 6 Gate 72 Facet Golden Dolphin Vogel Wand. The Golden Dolphin Vogel wands represent the next step in the evolution of the Vogel Dream Wands. Ray has incorporated the concave gates and flat facets into this new design, and added convex ridges with flat facets, designed to concentrate the flow of Universal Life Force Energy and deliver it at the cellular level. Like the Dream Wands, this new design connects the bearer to a Higher Octave of Energy, the energy configuration that exists in the realms above the seven physical chakras and the eighth chakra which is the locus of the Higher Self, the realm of the One Source of Energy that creates and sustains the Three Worlds. Pinto says that his design is unique in its ability to connect us with our own Divinity so that we may more fully emody Unity Consciousness here on Earth. 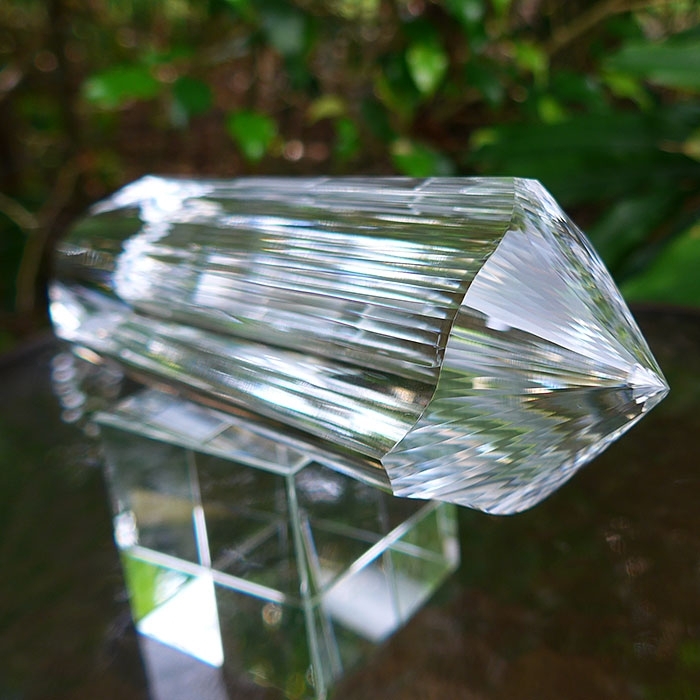 This Master Cut Vogel Wand has a powerful focused energy that enhances mental clarity, connecting the user with Higher Mind and amplifies the flow of healing energy to the recipient in a most remarkable fashion.. The Trinity is the world's most prevalent symbol of Divinity, and this 3 Convex Channel 72 Facet Golden Dolphin Vogel Wand is specifically designed to connect the bearer to Divine Light, Divine Love, Divine Mind, Divine Purpose and Divine Guidance. When using this beautiful, powerful wand in energy treatments on clients, I was surprised by the power of the piece. 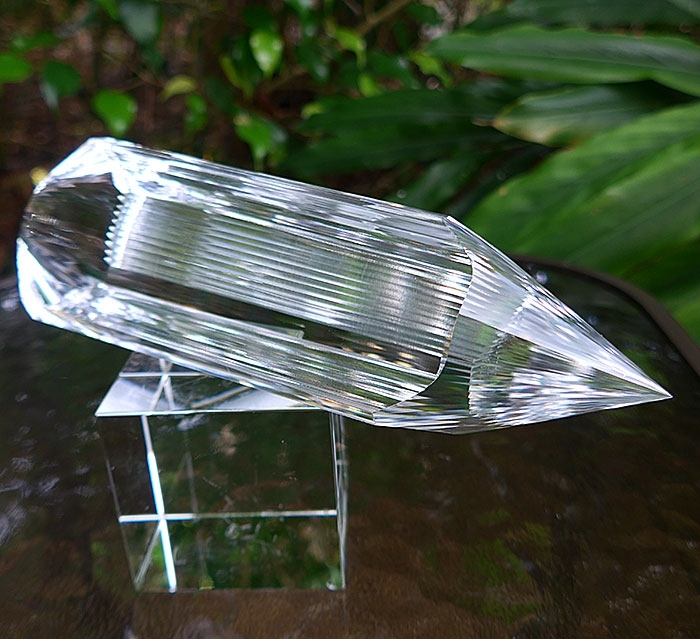 Size often matters, in crystal healing as in other realms, but in this case, the sacred geometry of the piece endows it with tremendous power, far exceeding what one would expect in a very portable, easy-to-hold crystal. I used this crystal for distance healing and also in meditation to send energy at a distance to large groups of people and found that it performed better than other similar crystals in our collection, delivering a strong flow of energy that exhibited extraordinary warmth, and seemed to penetrate deep into the physical body while also energizing the emotional and mental bodies simultaneously. Note: Weight above is shipping weight. Net weight is 26.65 oz. or 756 grams, excluding weight of pouch.